The Alonge Wig is available in Auburn, Black, Brown, or White. The wig features an elastic band on the inside for comfortable one size fits most sizing. With long, fancy curls, the Alonge Wig is styled after aristocratic hair fashions of the 1700's. 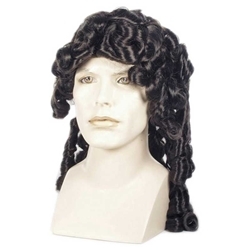 A wonderful wig for Captain Hook in Peter Pan, Moliere comedies, Cyrano, pirates, fops, and a host of other modern and historical characters.